King canopy bed, gas fireplace and jacuzzi tub in the heart of Maggie Valley! This is an authentic turn of the century log cabin with a modern twist. Complete with a Jacuzzi tub for two, a gas fireplace, and a king size canopy bed, this cabin is a perfect hide-away. This cabin offers cable flat screen TV, WiFi, snacking area with microwave, dorm size refrigerator and coffee maker and heating/air conditioning. Come sit on the porch and enjoy your private pond and waterfall! 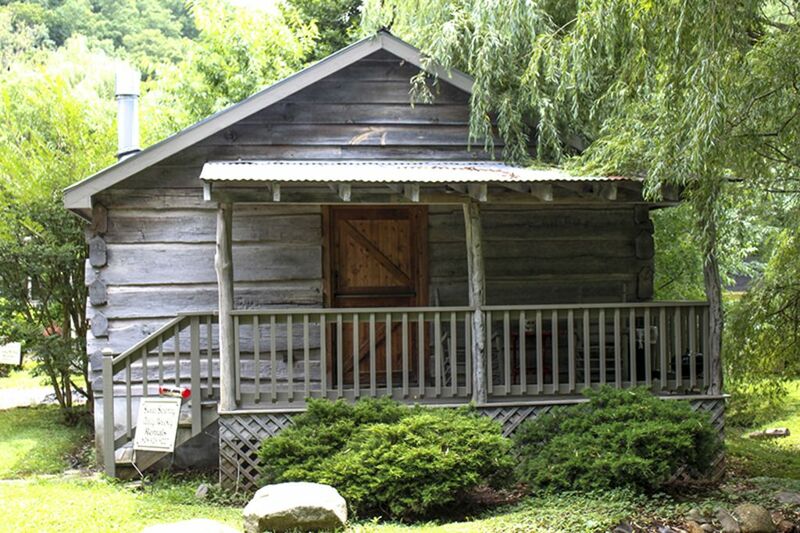 Quaint Cozy Cabin, perfect for a romantic weekend getaway! Great Cabin in a Wonderful Area! I got this for my son as a honeymoon trip. They had a wonderful time and enjoyed everything about the cabin. The location was a great base for trips to the parkway, Asheville, and Lake Lure. The hiked, found great little restaurants and rested so well. Thank you for making their time together so special. Our stay at Sweet Serenity was peaceful beautiful and memorable! Thanks to Miss Caroline! Our stay at Sweet Serenity was peaceful beautiful and memorable! Clean neat and homey. Look forward to returning! Charming cabin, perfect for 2 people. Great location with lots to do in the area, short drive to Cherokee and Bryson city. If you are looking for complete privacy this cabin is not for you, distant view is nice but it's located with view of run down motel on one side and camper park on other. Other than the view everything else was perfect. There are also other cottages adjacent to this one with better views. Sweet Serenity is a beautiful little cabin! My wife and I spent our honeymoon here and our stay was simply magical! Aside from the cabin, the area is lovely with lots to do. There is a limit of two dogs. We allow small to medium size dogs due to the square footage of our cabin.